It helps you relax – Long after your massage is over, you will still benefit from a host of brain chemistry responses that encourage feelings of relaxation, lowered stress and improved mood. Improves posture – Massage helps your body to reinforce healthy and natural movements, which will help correct any posture problems you may have. Improves circulation – The pressure from massage moves oxygen-rich blood through the body to damaged, tense muscles so they can heal, while removing lactic acid and other metabolic waste. Lowers blood pressure – Studies have shown that massage can lower both diastolic and systolic blood pressure. It relaxes muscles – Sitting causes a lot of chronic back pain and massage can help with persistent pain by relaxing those tense muscles. Improves flexibility – Sedimentary lifestyles and age can make joints less flexible. 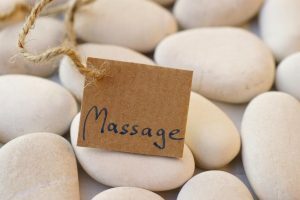 Massage helps improve fluidity and range of motion in your joints and connective tissues. Relieves headaches – Regular massage reduces your chance of developing a headache in the first place by relaxing muscle spasms and trigger points. Already have a headache? It can decrease the pain.